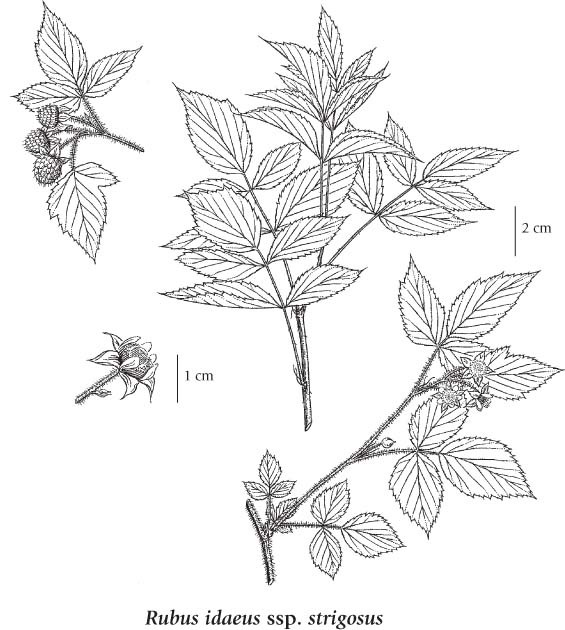 Medium shrub, 0.5-2 m tall, perennial with biennial stems (canes); stems erect to ascending, almost unarmed to prickly and bristly, often glandular-hairy, sometimes smooth and glaucous beneath the prickles; bark yellow to cinnamon-brown, shredding; similar to cultivated raspberry. Alternate, deciduous, pinnately compound, 5-20 cm long; leaflets 3 to 5 on first-year canes, mostly 3 on flowering canes, egg-shaped to broadly lanceolate, 3-10 cm long, double-saw-toothed and sharply long-pointed at the tip, greenish and smooth to sparsely hairy above, paler and greyish-woolly to nearly smooth beneath, the veins and leaf-stalks often glandular-prickly; stipules linear-awl-shaped, 4-10 mm long. Inflorescence of 1 to 4 stalked flowers in small, open, nodding, axillary or terminal clusters, the stalks often bristly-glandular; corollas white, the petals 5, erect, oblong-spoon-shaped, 4-7 mm long; calyces hairy to glandular-bristly, 5-lobed, the lobes lanceolate, bent back, 4-8 (12) mm long; ovaries superior; stamens 75-100. Drupelets, finely and thinly woolly, weakly coherent in a red egg-shaped cluster that falls intact from the dry receptacle (a raspberry), the berries 1-1.2 cm wide. Mesic to moist thickets, rocky slopes, clearings, burns, old fields and open forests in the lowland and montane zones; common throughout BC mostly in and east of the Coast-Cascade Mountains; E to NF and S to CA, N MX and NC. A shade-intolerant, submontane to subalpine, circumpolar deciduous shrub [transcontinental in North America (absent in hypermaritime and maritime climates)]. Occurs in continental boreal and wet temperate climates on fresh to very moist, nitrogen-rich soils. Plentiful in early successional communities on cutover and/ or bumt sites in the coast­interior ecotone; scattered in open-canopy stands on water­shedding and water-receiving sites. Usually associated with Epilobium angustifolium and Rubus parviflorus. May hinder natural regeneration and growth of shade-intolerant conifers. A nitrophytic species characteristic of disturbed sites.